Existing in a space essentially creates a non-verbal conversation between the participant and their surrounding. The conversations works by means of interaction, where either the atmosphere is physically manipulated by the living inhabitant or the unmoving space influences in the inhabitant in some way. As an artist, one is succumb to such influences and in turn integrates it into their practice, which is what could be seen from a recent exhibition at Studio Seven. Curated by Arif Hussain Khokar, ‘Spaces’ was a group exhibition that displayed the works of four artists namely, Asad Nizamani, Bahrera Basit, Namrah Fatima and Sabeen Ahsan. Asad Nizamani’s monochromatic paintings depict silhouette-like halls, almost entirely blackened out by darkness. As the artist’s explains, he is intrigued and also intimidated by dimly lit spaces, which create tensions of what could possibly be lurking further in the darkness. His works are subtle as they command attention with meekness through skilful drawing and rendering. The attention to detail present almost exact replicas of the possible space and his perspective introduces an alluring illusion of three dimensionality onto the two dimensional surface. 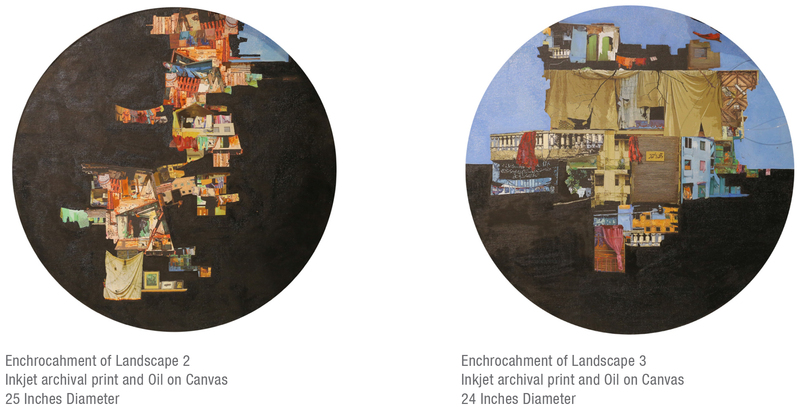 In almost direct contrast to Nizamani’s dimly lit open spaces are the paintings of Bahrera Basit. The canvases are brightly coloured and claustrophobic in nature. Basit comments on the impermanence of a space and how it continues to shift. The works are buildings and balconies varying in size and placed one on top of each other, much like an uneven Jenga tower. They are reminiscent of the general concrete maze that has enveloped Karachi over the recent years. Constant construction of new housing, offices etc. can always be seen happening somewhere in the city with high rises standing just feet away from each other. It also brings to mind the kachi abadi’s hidings in corners of Karachi that cater to those to can’t afford the rising estate prices. 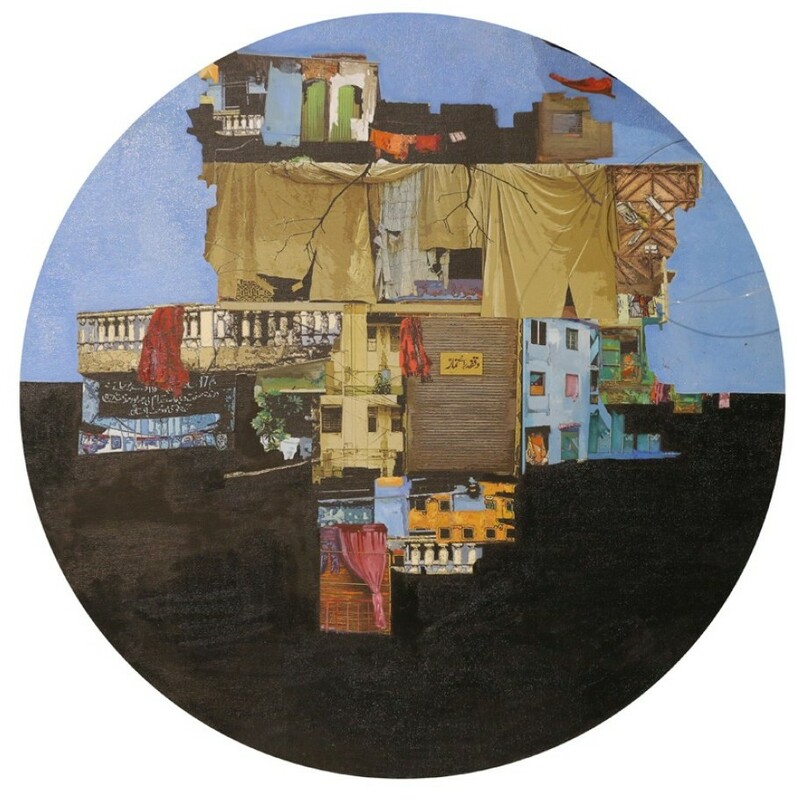 Namrah Fatima also paints scenes of overfilled and cramped up spaces. However, this artist zooms into the cabinets and storage areas of living spaces, particularly looking at the items one tends to hide from public viewing. 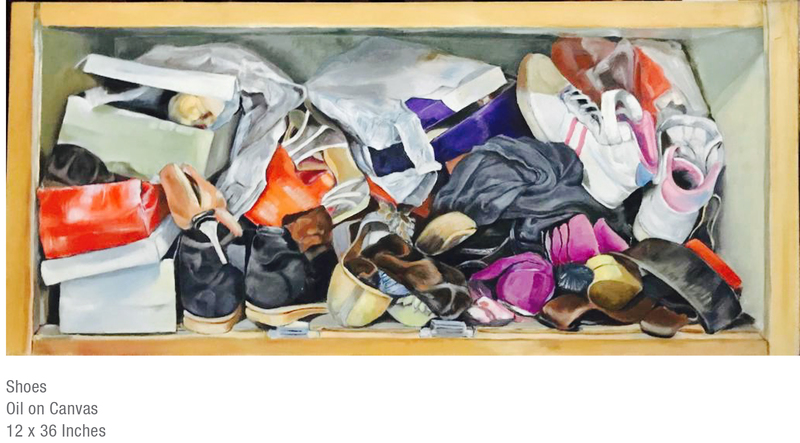 Her realistic paintings all provide a frontal view of cupboards hiding material meant to be disposed, those used for cleaning purposes or those kept in storage. Her works gives the audience a unique viewpoint into a person’s life, particularly one that they may not want you to see. The paintings appear as dirty little secrets, which also give the audience a glimpse to the type of people living in that space. Sabeen Ahsan looks at the impressions various forms may leave. 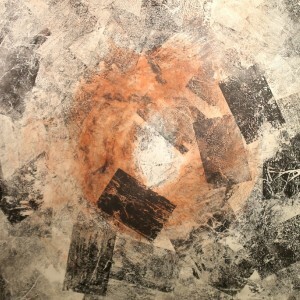 In essence her works become visuals of the absence of an object or the memory of a space. 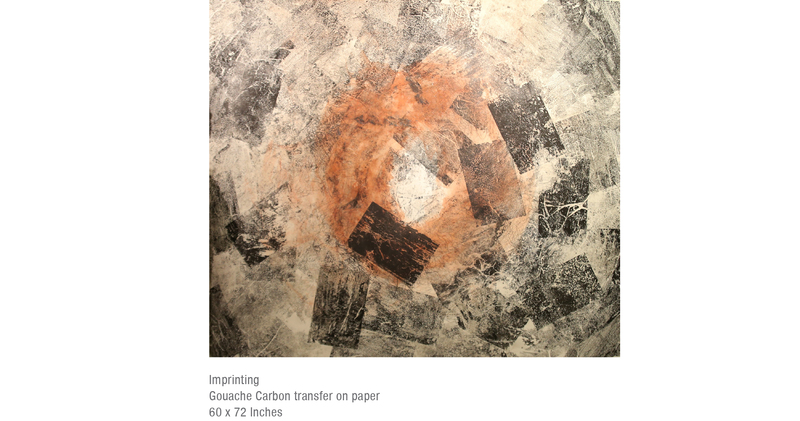 By using a mixture of paint and multiple imprinting techniques, the artist allows the process to dictate the outcome. Eventually the final product may be completely different, creating a new form, abstract in nature and different from it’s initial aesthetic. Ahsan describes her work as depictions of her sensory experiences, which means that the viewer is given a unique view of not only the space the artist may have been experimenting with but also the artist herself, her thoughts, feelings and reactions to the surrounding atmosphere. Her pieces add a holistic essence to the exhibition, where they invigorate more than just the visual senses. The exhibition continued from 6th – 13th November 2018 at Studio Seven, Karachi.